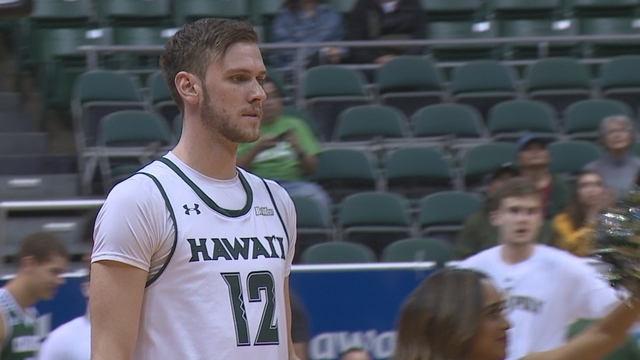 HONOLULU – The University of Hawai'i men's basketball team put on an offensive display in rolling to an 87-64 win over UC Riverside Saturday night at the Stan Sheriff Center. The Rainbow Warriors improved to 16-9 overall and into sole possession of third place in the Big West with a 7-4 mark. The 'Bows shot a season-high 59 percent and buried 13 three-pointers – one shy of a school record – in winning its second straight home game in convincing fashion. UH led from wire-to-wire and were never threatened by the Highlanders (9-18, 3-8 BWC) who were just two days removed from a 14-point win over UC Santa Barbara. Jack Purchase scored a game-high 23 points on 8-of-12 shooting and drilled five three-pointers during a milestone evening. The senior forward took sole ownership of the career three-point record, setting a new mark on his very first attempt of the game. Purchase, who also added nine rebounds in the win, now has 185 for his career, surpassing Zane Johnson's record of 180. Brocke Stepteau added 17 points with 15 of those coming in the first 10 minutes of the game to help UH surge ahead early. Eddie Stansberry also returned to form with 15 points, while Drew Buggs again orchestrated the UH offense with a team-high eight assists and no turnovers. In the first meeting between the teams in Riverside last month, the Highlanders defeated UH on the strength of 13 three-pointers. This time, UH turned the tables. The 'Bows went 9-of-13 from behind the arc and shot 62 percent from the floor in the first half alone to take a commanding 50-29 lead at the break. It was the most first-half points for UH all season. Hawai'i didn't let up in the second half, building its lead to as many as 29 points. UH finished the game with 23 assists on 33 field goals and in a familiar theme took care of the ball with just nine turnovers. The Rainbow Warriors have had single-digit turnovers in five of the last six games. The Rainbow Warriors will next head for the road for a pair of games on the Central Coast, beginning with a meeting vs. UC Santa Barbara on Thursday, Feb. 21. Tipoff is at 8:00 p.m. PT/6:00 p.m. HT and will be televised on ESPNU.